What made you decide to build the winery? Xavier: Once we realized the potential of our unique site, and once the vineyards started to thrive, we were driven to build a winery worthy of the commitment we had made to the grapes. Given the attention lavished on the vines, it was fundamental that we carried this through to the wines. It was inescapable. We had to do it properly; I don’t believe in half-measures. It’s like anything that you take seriously: you can’t act selectively when it’s convenient. What does state-of-the-art mean to you? Jean-Louis: Hand-harvesting, double-selection, gravity flow in the winery, small tanks to vinify each mini-block separately, a combination of oak, concrete and stainless steel tanks, scrupulous hygiene and storage, extensive fine-tuning of barrel choices to add distinction to top quality wines and bottling according to the biodynamic calendar on ‘fruit’ and ‘flower’ days. So what was your plan for the ultimate winery? Xavier: When it was clear that building an outstanding winery was our next essential task, we spent several years with renowned advisers visiting some of the most impressive wineries in the world and studying their equipment and layout. It’s hard to believe it’s on four floors? Xavier: We then designed and equipped the winery specifically for small batches, hand-crafted high quality winemaking. Our determination is to ensure meticulous nurturing of the grapes at every stage. We decided to design a building that moved the grapes and the wine through the gentle flow of gravity, without pumping. We were insistent on not disrupting the landscape. 2006 was the first vintage we made in the winery. 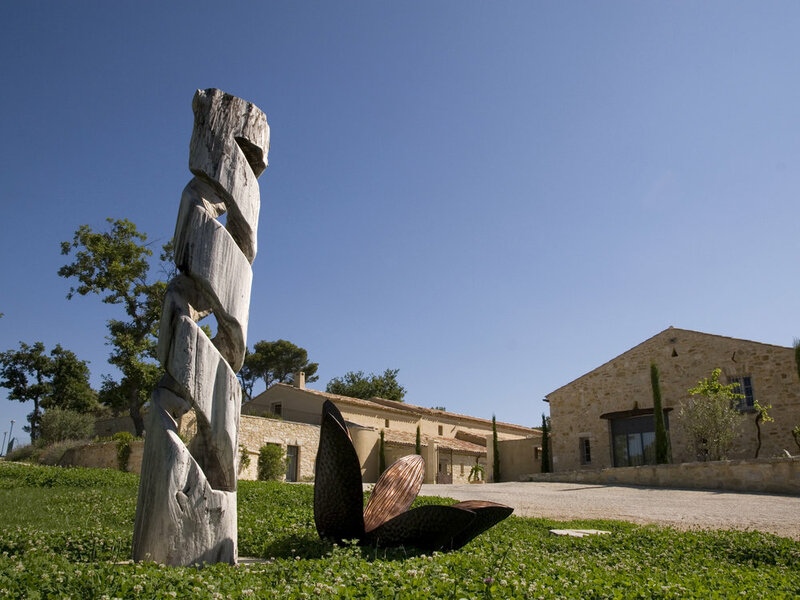 Jean-Louis: Chêne Bleu has one of the highest wineries in the Vaucluse Department, and in Provence. It was a huge project. We were able to use the topography to create just what we wanted. We needed 4 levels, so we dug a hole 12m [36ft] deep and nestled the top two storeys against a hill. Architect Gilles Gregoire and project manager Raynald Baty of En Volume oversaw the construction. It sounds easy but it was an enormous piece of work digging into solid rock. We used the stones they they excavated as the base of the helicopter pad. We used special materials instead of the usual reinforced concrete to avoid the ‘Faradic cage effect’. This, named after the 19th-century scientist Michael Faraday, describes the potential for electromagnetic energy to be trapped inside the structure, potentially affecting the wine. Exacting Practices – a very Darwinistic Process! In the vineyard: the bunches of ripe grapes are harvested into shallow alimentary plastic crates to protect the integrity of the fruit. 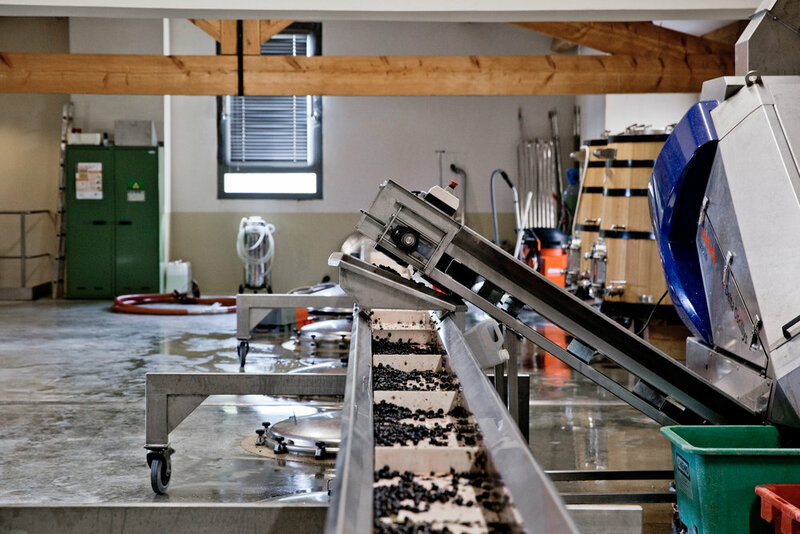 In the winery: grapes are selected twice, on separate sorting tables. A slow-moving belt sorts bunches and removes leaves and all other kinds of imperfections and non qualitative aspects. All whites and 90% of reds are de-stemmed (very ripe stems can sometimes benefit a red wine fermentation). Vaslin presses: the closed cylinders with their pneumatic bags ensure gentle pressing with less risk of excess tannin extraction and oxidation. Fermentation vessels: 7 conical oak tanks for natural micro-oxygenation for some reds. Tight grain, ‘low toast’ oak ensures purity of fruit expression. 25 temperature-controlled stainless steel tanks for some reds, and all whites and rosés. Storage: 17 concrete tanks which provide a stable, inert environment to hold the wine between fermentation and barrel aging. We use a selection of French coopers including Damy, François Frères, Seguin-Moreau, and Taransaud… The oak is French (Tronçais and Nièvre), with different light toasts. We use a range of sizes – Burgundy barrel (228 l), demi-muid (600 l), muid’oc (320 l) - to complement our parcelles. Bottling: on the auspicious days in the biodynamic calendar, known as the ‘flower’ and ‘fruit’ days. Our Bamboo Forest: The wastewater on the property is sent to our half-hectare bamboo plantation behind the winery. It passes through the rhizomes, where naturally occurring micro-organisms degrade the organic matter, allowing pure water to be put back into nature. This safe treatment has very low energy demands and does not require the use of chemicals. This treatment blends easily with the landscape, helping to maintain the natural beauty of the Domaine, in a zero-impact management plan.